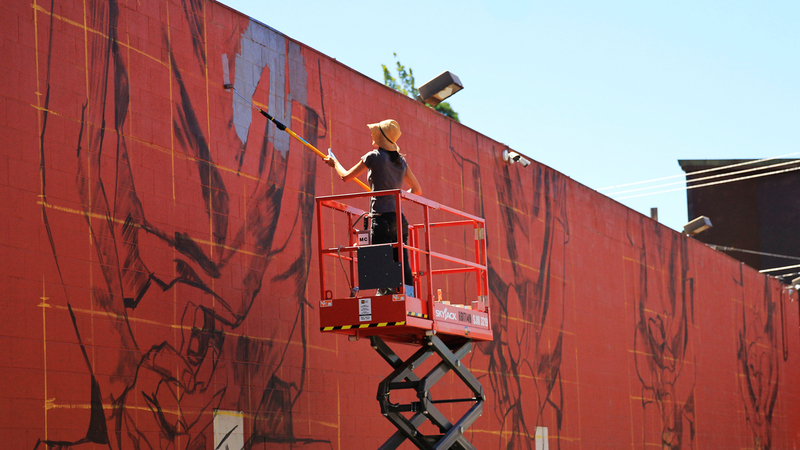 The Argentina-born, Spain-residing Hyuro stayed close to what she’s known for with her mural on the 140-foot long north wall of the Kiva Grocery on West 11th Avenue in Eugene. Her works often feature repetitive and faceless figures, imparting playfulness while addressing issues of politics, nature and feminine identity into her art. Titled “Secuencia inversa de un acto de desctrucción,” which translated means “reverse sequence of an act of destruction,” Hyuro painted four panels showing a woman’s hands surrounding a plant and helping it recover from damage.